Angela Min Yi Hou is a Chinese citizen and Canadian permanent resident finishing her last year of undergraduate studies at the University of Toronto, double majoring in International Relations and Contemporary Asian Studies. As an eight-year MUNer, Angela is grateful and excited to be a part of the BDMUNC team as the Secretary-General. 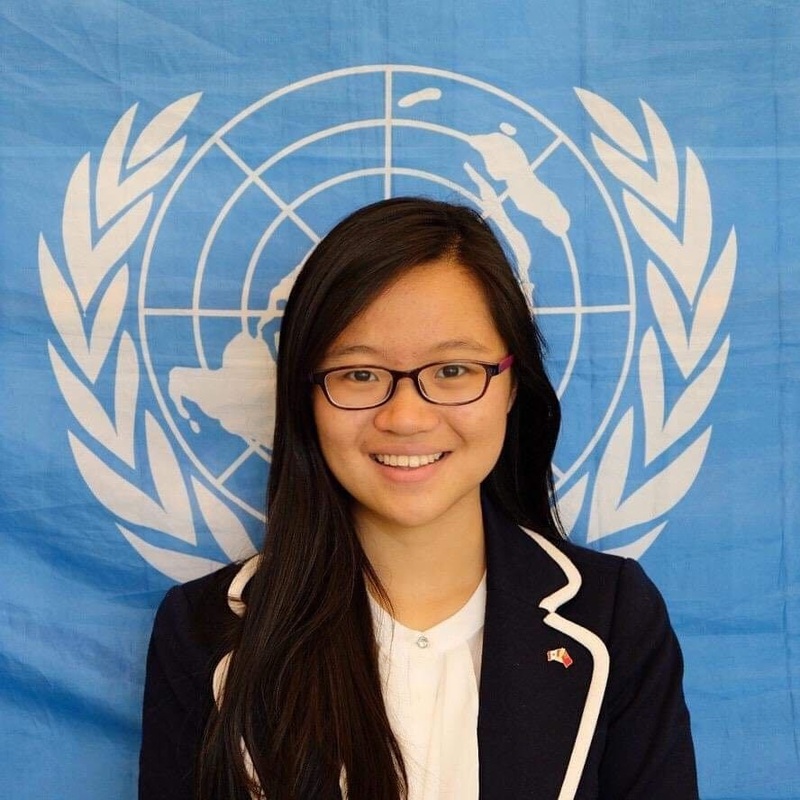 Her previous MUN experiences include serving on the Secretariat of the World Federation of United Nations Associations International Model United Nations (WIMUN) conference in New York, and organizing MUN conferences in her local circuit in Ontario. For the past three summers, Angela has joined Best Delegate’s Model United Nations Institute as a Diplomacy Fellow and MUN Mentor, working with middle and high school students from around the world. When not MUN-ing, Angela can be found trying to learn the French language, singing Chinese music, or working on compliance analysis as a part of the G7/G20/BRICS Global Governance Research Groups housed at the Munk School of Global Affairs and Public Policy, University of Toronto. Sam Taglia is an American in his fourth and final year at The Ohio State University studying Cultural Anthropology and Public Affairs. He has previously served as a MUN Mentor for the 2018 Best Delegate Summer Institute and as Chief of Staff for Ohio State Universities High School Model UN Conference, OSUMUN. He is currently the President of OSU's Collegiate Council on World Affairs, and leads Ohio States MUN team to conferences across the US and Canada. Best Delegate introduced Sam to his passion for teaching, and his ambition is to pursue a teaching position in primary education after he graduates from Ohio State. Madeleine Northfield is a 2nd year student at McGill University in Quebec, Canada. A Canadian born and raised in Toronto, she has been involved with Model UN for the past 6 years, and studies International Development and Economics. In her time with MUN Madeleine has served on a variety of secretariats, committee Dais’s and as a delegate all across the United States and Canada. During this past summer Madeleine worked as a Diplomacy Fellow for MUNI 2018, and remains on the Best Delegate media team as Social Media Manager. When she’s not doing MUN Madeleine is deeply involved with Plan Canada’s Because I am a Girl youth project, enjoys to cook or spend time with her family traveling. Logan Smith is a junior at the University of Miami, where he studies Jazz Vocal Performance, as well as Political Science on a Pre-Law track. Logan carries with him a strong passion for Model UN, attending and staffing over fifteen conferences during his three year tenure on the highly-ranked University of Miami traveling team. Smith also currently serves as the Secretary General for the Miami-Dade Model United Nations conference. In the past, Logan has worked with the Best Delegate Model United Nations Institute as a Residential Counselor and Diplomacy Fellow, working to enhance student knowledge of the activity of Model UN, while also working to promote strong personal development in his students. Logan's focus in Model UN lies in using a strong research background and a collaborative attitude to bring about strong positive solutions in the committee room. He is excited to welcome students to the first ever Best Delegate Model United Nations Conference, and would like to wish everyone a wonderful weekend of debate!